This article is about the fruit tree and its fruit. For the trimming of fruit tree branches, see Fruit tree pruning. For pruning of trees and plants in general, see Pruning. For other uses, see Prune (disambiguation). A prune is a dried plum of any cultivar, mostly the European plum (Prunus domestica). Use of the term "prune" for fresh plums is obsolete except when applied to varieties (of plum) grown for drying. Most prunes are freestone cultivars (the pit is easy to remove), whereas most plums grown for fresh consumption are clingstone (the pit is more difficult to remove). Prunes are 64% carbohydrates including dietary fiber, 2% protein, a rich source of vitamin K, and a moderate source of B vitamins and dietary minerals. The sorbitol content of dietary fiber likely provides the laxative effect associated with consuming prunes. Contrary to the name, boiled plums or prunes are not used to make sugar plums. More than 1,000 plum cultivars are grown for drying. The main cultivar grown in the United States is the 'Improved French' prune. Other varieties include 'Sutter', 'Tulare Giant', 'Moyer', 'Imperial', 'Italian', and greengages. Fresh prunes reach the market earlier than fresh plums and are usually smaller in size. In 2001, plum growers in the United States were authorized by the Food and Drug Administration to call prunes "dried plums". Due to a perception that prunes relieve constipation (perceived as derogatory), distributors stopped using the word "prune" on packaging labels in favor of "dried plums". Prunes contain dietary fiber (about 7% of weight; table) which may provide laxative effects,. Their sorbitol content may also be responsible, a conclusion reached in a 2012 review by the European Food Safety Authority. The report also demonstrated that prunes effectively contribute to the maintenance of normal bowel function in the general population if consumed in quantities of at least 100 grams (3.5 oz) per day. Prunes are 31% water, 64% carbohydrates, including 7% dietary fiber, 2% protein, and less than 1% fat (table). Prunes are a rich source of vitamin K (57% of the Daily Value, DV) and a moderate source of several B vitamins and dietary minerals (10-16% DV; table). Prunes and prune juice contain phytochemicals, including phenolic compounds (mainly as neochlorogenic acids and chlorogenic acids) and sorbitol. Prunes are used in preparing both sweet and savory dishes. 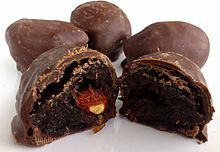 Contrary to the name, boiled plums or prunes are not used to make sugar plums, which instead may be a nut, seed, or spice coated with hard sugar, also called a comfit. 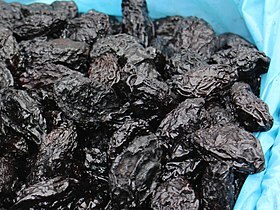 ^ "Dehydrated Prunes Grades and Standards". Agricultural Marketing Service, US Department of Agriculture. 2017. Retrieved 15 May 2017. ^ "FDA Approves Prune Name Change". ABC News. 6 January 2006. Retrieved 14 July 2016. ^ Janick, Jules and Robert E. Paull (2008). The Encyclopedia of Fruit and Nuts. CABI. ISBN 0-85199-638-8. p. 696. ^ a b Stacewicz-Sapuntzakis, M; Bowen, PE; Hussain, EA; Damayanti-Wood, BI; Farnsworth, NR (2001). "Chemical composition and potential health effects of prunes: a functional food?". Critical Reviews in Food Science and Nutrition. 41 (4): 251–86. doi:10.1080/20014091091814. PMID 11401245. ^ a b EFSA Panel on Dietetic Products, Nutrition and Allergies (NDA) (2012). "Scientific Opinion on the substantiation of health claims related to dried plums of 'prune' cultivars (Prunus domestica L.) and maintenance of normal bowel function (ID 1164, further assessment) pursuant to Article 13(1) of Regulation (EC) No 1924/2006". EFSA Journal. 10 (6): 2712. doi:10.2903/j.efsa.2012.2712. ^ Kawash, Samira (22 December 2010). "Sugar Plums: They're Not What You Think They Are". The Atlantic. Retrieved 13 July 2017. Wikimedia Commons has media related to Prune. This page was last edited on 9 April 2019, at 04:25 (UTC).